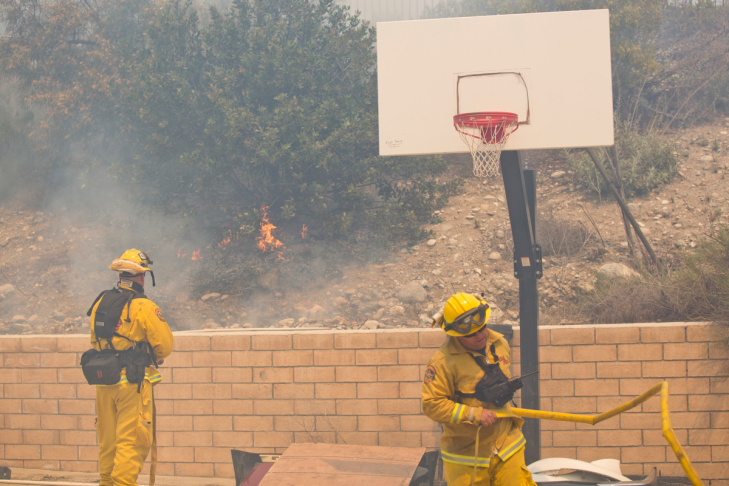 Firefighters battle flames at Banyan Street near Los Osos High School as the Etiwanda Fire burns in Rancho Cucamonga on Wednesday, April 30, 2014. 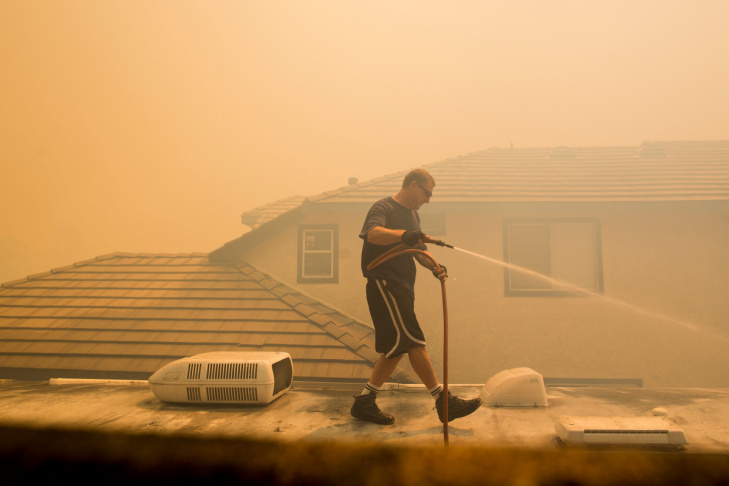 Resident Bert Newman hoses his backyard as the Etiwanda Fire burns in Rancho Cucamonga on Wednesday, April 30, 2014. Newman lives on the south side of Banyan Street, near an open brush area that has burned. 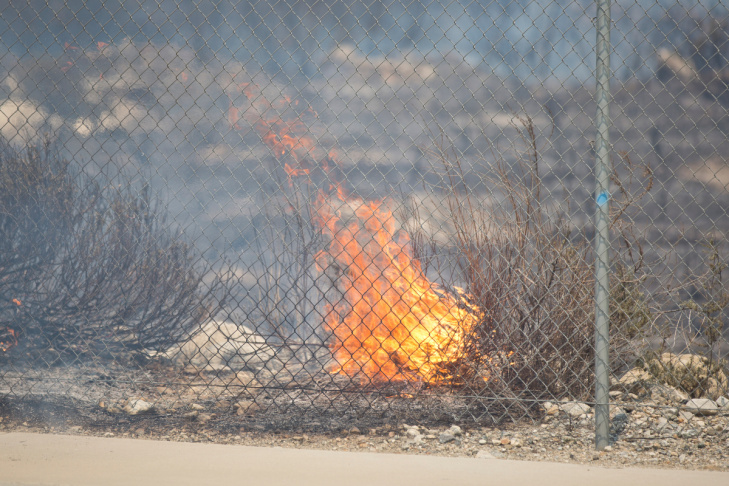 Flames burn north of Banyan Street as the Etiwanda Fire burns in Rancho Cucamonga on Wednesday, April 30, 2014. Onlookers watch as firefighters fight flames near Banyan Street and Los Osos High School as the Etiwanda Fire burns in Rancho Cucamonga on Wednesday, April 30, 2014. 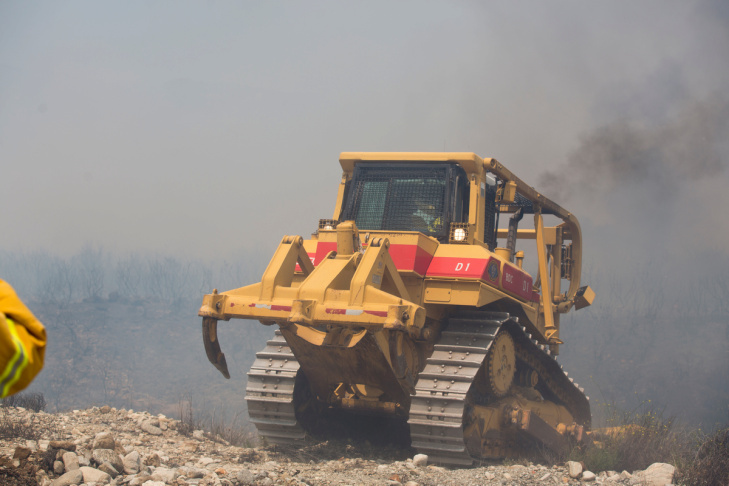 San Bernardino County Fire brings in a bulldozer to fight flames north of Banyan Street as the Etiwanda Fire burns in Rancho Cucamonga on Wednesday, April 30, 2014. Firefighters fight flames from across Banyan Street using a hose on top of a fire truck as the Etiwanda Fire burns in Rancho Cucamonga on Wednesday, April 30, 2014. The Etiwanda Fire burns in Rancho Cucamonga on Wednesday, April 30, 2014. 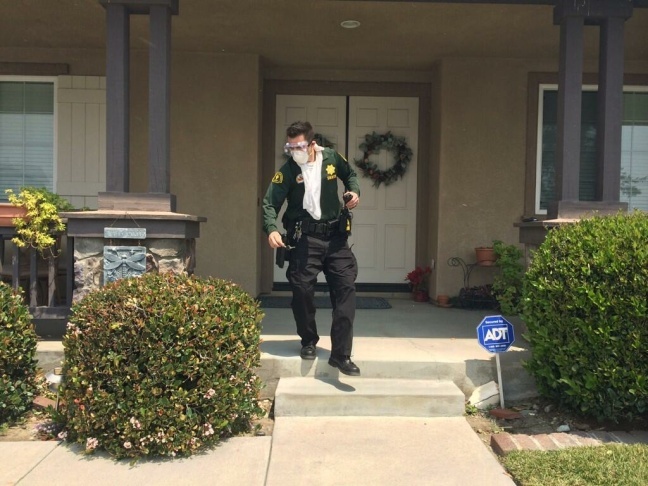 Sheriffs running around Blackstine Street in Rancho Cucamonga knocking on doors, telling residents to evacuate immediately, on Wednesday, April 30, 2014. 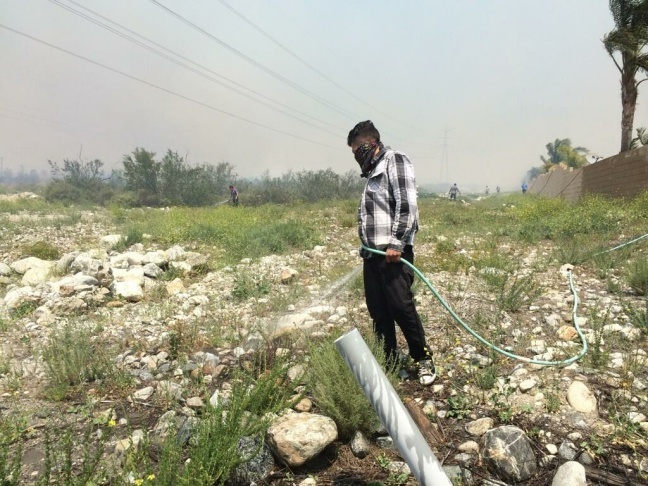 Ernesto Dominguez hosing down brush near his cousin's house as the Etiwanda Fire nears Banyan Avenue on Wednesday, April 30, 2014. 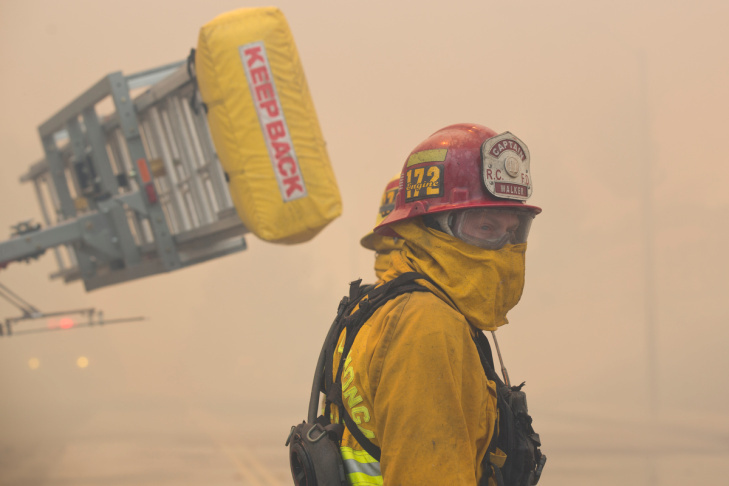 A firefighter puts out flames on an electrical pole so that it won't fall and block a firetruck's escape route near the Etiwanda Fire on Wednesday, April 30, 2014. 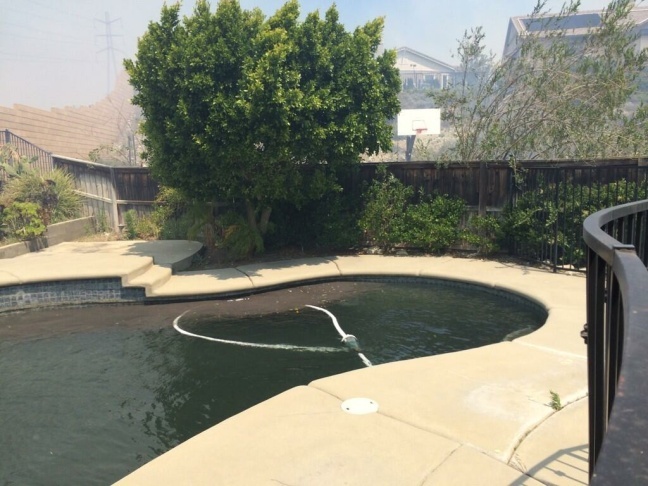 A swimming pool filled with soot from the Etiwanda Fire on Wednesday, April 30, 2014. 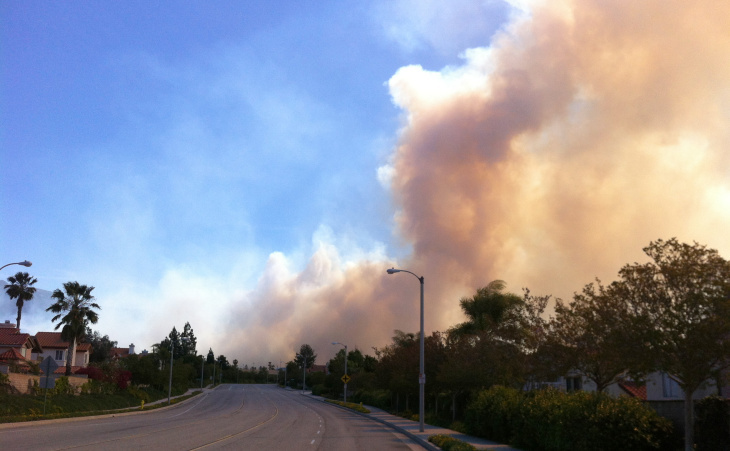 Smoke from a wildfire can be seen in Rancho Cucamonga, Calif., Wednesday April 30, 2014. 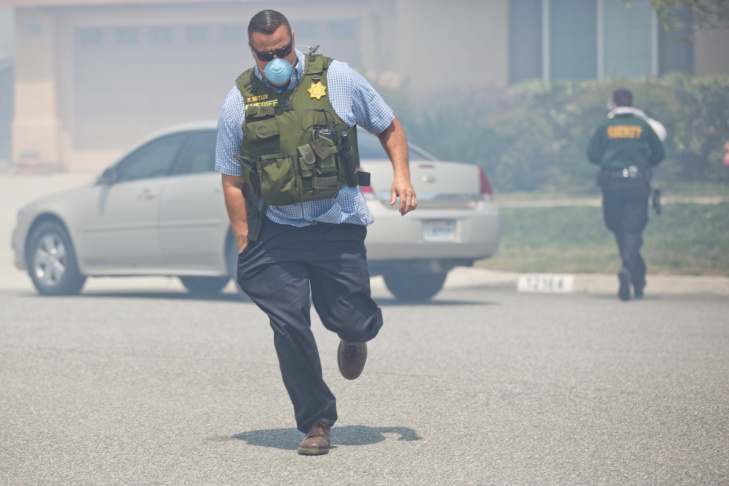 Schools and homes were evacuated Wednesday, as dry, gusty winds fanned a smoky wildfire in the foothills of the San Bernardino Mountains in California. Several schools were shut down due to the smoky conditions in parts of Rancho Cucamonga, a city of 165,000 people east of Los Angeles. 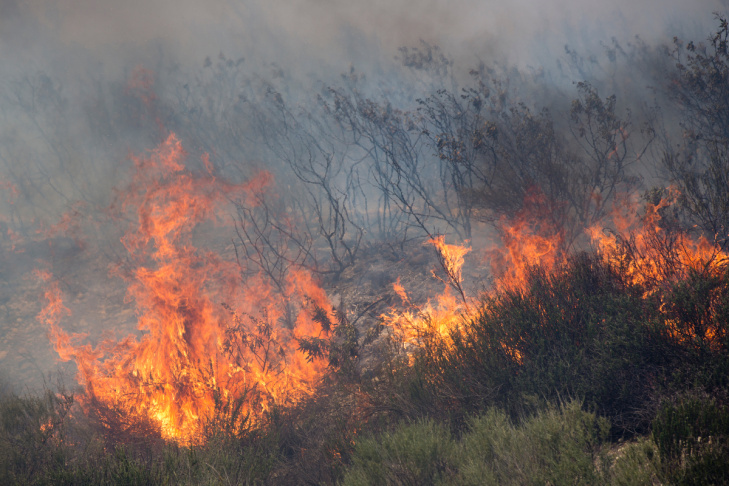 A 1,000-acre wildfire is burning in Day Canyon in the Etiwanda Reserve north of Rancho Cucamonga, according to the U.S. Forest Service. Authorities say at least 1,165 homes and several schools were evacuated Wednesday afternoon. Officials have since lifted mandatory evacuation orders, but are encouraging residents on a stretch of road to remain vigilant. Officials at the San Bernardino National Forest tweeted that mandatory evacuations have been lifted for residents near the burn area. Fire officials say they'll keep voluntary evacuations in place for residents north of Hillside between Haven and Milliken avenues. A wild fire burning north of Rancho Cucamonga has spread to at least 1,000 acres with no containment, reports San Bernardino National Forest. Approximately 1,650 homes are under mandatory evacuation. This includes homes north of Banyan between Rochester and Etiwanda Avenue and north of Wilson between Day Creek Wash and Etiwanda Avenue. All vehicles, including media, are currently not allowed on Day Creek Boulevard north of Banyan Street, according to San Bernardino Country Sheriff Deputy T. Lee. Onlookers are gathering on Banyan Street and Mt. Baldy Place to watch the flames. Five hundred fifty personnel have been deployed to the fire. An evacuation Center for people and animals is at Central Park on Baseline/Milliken in Rancho Cucamonga. Small Animals can be taken directly to Animal Center at 11780 Arrow Route, Rancho Cucamonga. At an afternoon news conference, fire officials confirmed that one house did catch fire, but that firefighters were able to extinguish it. The extent of the damage was unknown. No structures have been lost. Wind gusts topped 80 miles per hour, which is why officials had no containment estimate yet, according to fire officials — they say they don't know what the winds will make the fire do. Officials say that their aircraft can't fly when winds are higher than 30 miles per hour, and even if they could, the wind would blow any water that was dropped away. There were both mandatory and voluntary evacuation areas. Charred brush and flames can be seen on the north side of Banyan Street near Rochester Avenue. There are electrical wires in the open area north of Banyan. Firefighters were working to put out flames on an electrical pole to prevent it from falling onto the road and blocking the fire truck escape route. The concrete sidewalk at Banyan Avenue is providing a stopping point for the flames, which die out right at a metal fence along the sidewalk. Intermittent gusts of wind are pushing dust and smoke toward Banyan Street, which remains closed at Day Creek Boulevard. 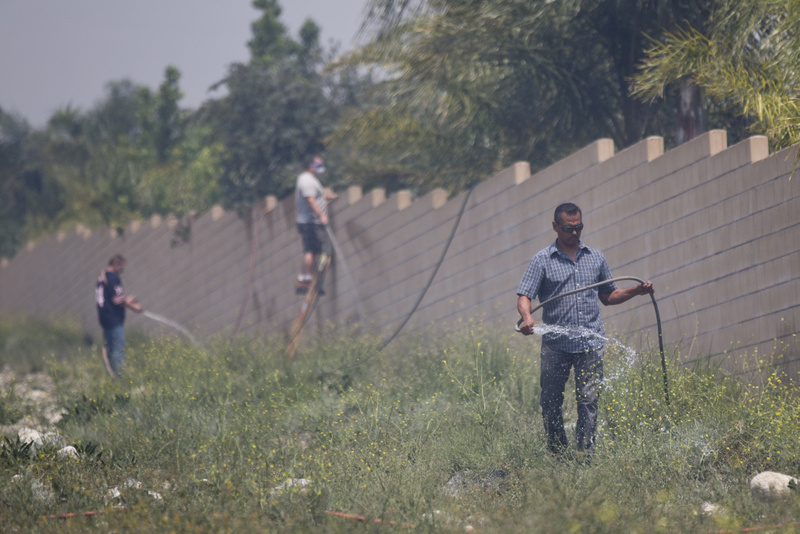 Ernesto Dominquez was hosing down brush along Banyan Street, near where his cousin lives. Other nearby residents could also be seen hosing down the area. 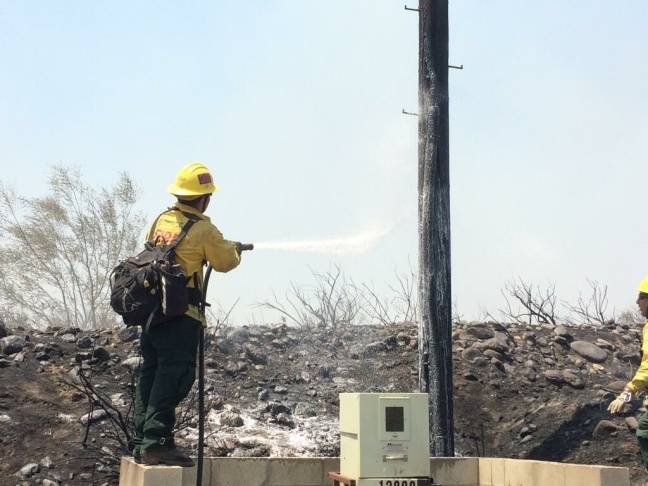 The Etiwanda Fire has now burned 800 acres, according to the U.S. Forest Service, with the southern boundary of the evacuation area at Banyan Street. Alan Tibbits owns Rancho De Philo Winery in the Alta Loma neighborhood. His home is also on the property — it's just a quarter-mile below the current evacuation area. Tibbits says he doesn't plan on leaving until he's told to. He's standing by to help relatives who are closer to the mountains. "The fire crews did an incredible job along the bottom of the mountain and they need to have the area cleared out of cars so that they can be effective," Tibbits said. The Etiwanda Fire is now 650 acres, according to the U.S. Forest Service. Fire officials say they've saved one home from the fire, according to the Los Angeles Times' Ruben Vives. The wind gusts are spreading thick smoke and dust, burning the eyes of those in the area. Southland air quality officials have issued a smoke advisory for a wide area because of the Etiwanda Fire, while air quality has reached unhealthy levels in the area. “The high winds have pushed the smoke from the Etiwanda Fire across several miles,” says Sam Atwood, spokesman for the South Coast Air Quality Management District. The smoke has pushed the air quality into unhealthy levels in western San Bernardino and eastern Los Angeles counties, Atwood says. “It is a good distance and it reflects the high winds of 50 miles per hour or higher, and the fact that the fire is not at all contained but in fact growing," Atwood said. Communities affected by unhealthy air quality include Rancho Cucamonga, Upland, Ontario, Chino, Chino Hills, Riverside, Norco, Corona, Pomona, Diamond Bar, Walnut, San Dimas, La Verne and Claremont. The area affected is “west of Rancho Cucamonga pretty much all the way to the 57 Freeway,” Atwood said. What makes this noteworthy is the smoke is being dispersed so rapidly because of the high winds, Atwood said. In a different fire, we might see this type of smoke dispersal over a couple of days, according to Atwood. “But with this high wind situation, we are seeing the smoke impact a wide area over just a couple of hours," Atwood said. Holly Gribbin, 15 years old, attends Los Osos High School and says her family was one of the last on her street to evacuate. "All my friends already left and they have been calling me, screaming at me to leave," Gribbin said. 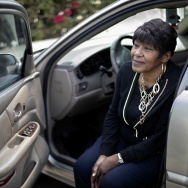 "The officers finally told me to leave; I don't know why they haven't done that earlier." "I already left school obviously," Gribbin said. They're planning to head to her grandmother's home in Claremont so that they'll be away fro the fire, and plan to "do whatever we can" for now. "We packed money, passports, clothes; we took pictures of everything — just in case if something happens." Gribbin said she's had one similar experience with the 2003 fire that hit the area — "But it was never this bad; this is crazy." Authorities say at least 1,100 homes and several schools have been evacuated as dry, gusty winds send smoke from a wildfire into Rancho Cucamonga in the foothills of the San Bernardino Mountains. Officials say mandatory evacuations were ordered Wednesday due to the smoky conditions in parts of Rancho Cucamonga, a city of 165,000 people east of Los Angeles. 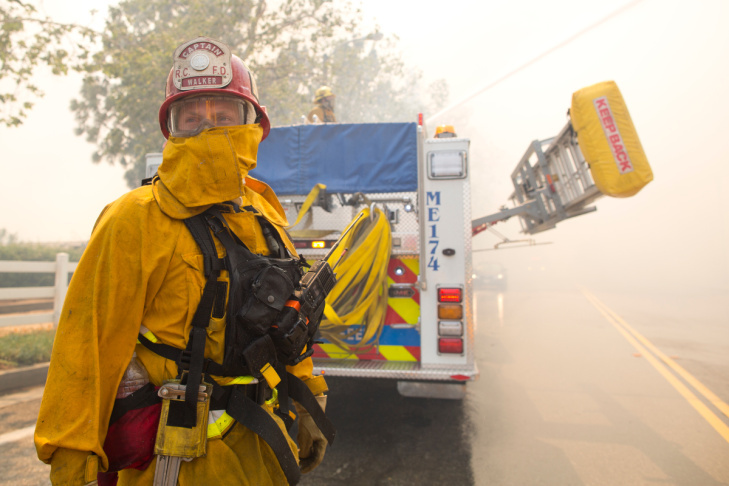 The fire has burned at least 200 acres of brush sapped of moisture by two days of Santa Ana winds, unseasonably high temperatures and low relative humidity. High winds have prevented firefighting helicopters from taking to the air. No containment figure has been announced. 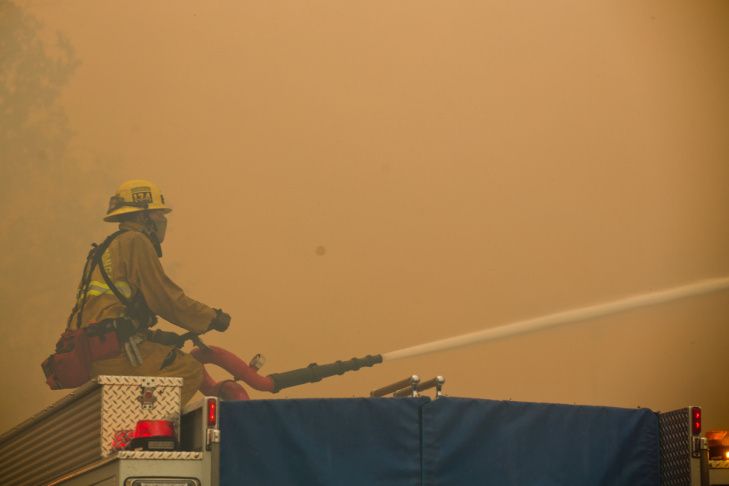 At least three schools were shut down due to the smoky conditions in parts of Rancho Cucamonga. Classes were canceled at Los Osos High School about an hour after the fire started. "We're evacuating cause there's high winds and there's a fire right up there," student Shane McHale told KTTV, pointing to the mountains. A wind-driven fast-moving wildfire near Rancho Cucamonga is making it difficult for fire crews to tackle the flames. John Miller with the U.S. Forest Service says firefighting helicopters are grounded because of the strong winds. "Aircraft are limited by conditions, and with gusts in the excess of 80 miles per hour, it is just not safe to fly helicopters or fixed-winged aircraft into the fire," Miller said. The helicopters will be deployed as soon as the winds calm down, Miller says. 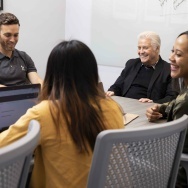 Kaiser closed their Rancho Cucamonga office due to the Etiwanda Fire, according to the Los Angeles News Group's Sarah Batcha. Los Angeles County Fire says they're sending strike teams to San Bernardino County to assist with the Etiwanda Fire. Golden Elementary School has been added to the schools being evacuated, according to the Etiwanda School District. As of 11:15 a.m., the city of Rancho Cucamonga has announced the following road closures: Etiwanda Avenue between Banyan Street and the north city limits; Day Creek Boulevard between Banyan Street and the north city limits; Milliken Avenue between Wilson Avenue and the north city limits; Hillside Avenue between Haven Avenue and the west city limits; and Banyan Street between Banyan Street and Day Creek. Firefighting planes and helicopters remain grounded due to high winds, U.S. Forest Service spokesman John Miller tells KPCC, unable to take on the 200-acre Etiwanda Fire. There are 550 personnel fighting the fire, according to the Forest Service, with 30 engines and 18 crews — and aircraft available on the ground. Current winds are around 60 miles per hour. The evacuation area is now west of Etiwanda, north of Wilson and east of Day Creek wash, according to the Forest Service. Animals can be taken to the County Animal Shelter in Devore. An evacuation center has been set up at Central Park at Base Line Road and Milliken Avenue in Rancho Cucamonga, according to the U.S. Forest Service. Los Osos High School is being evacuated, according to the school. Other schools already closed include Caryn Elementary School, Day Creek Intermediate School and Chafee College. The fire has jumped a brick wall and is moving toward homes, according to Los Angeles News Group reporter Doug Saunders. John Miller from the U.S. Forest Service told KPCC that the city of Rancho Cucamonga has initiated mandatory evacuations. "The fire has grown with wind gusts up to 80 miles an hour," Miller said. “It is a wind-driven fire and the winds are out in the north and blowing downhill toward homes, and of course, protection of life and then property is our number one priority." The fire is currently being managed between various entities: U.S. Forest Service, CalFire, Rancho Cucamonga Fire Protection District and the Rancho Cucamonga Police Department, according to Miller. A Cal Fire spokesperson told KTLA that aircraft in the area have been grounded due to high winds, leaving firefighters unable to use aircraft to fight the flames. Evacuation orders have been issued west of Etiwanda, north of Wilson and east of Day Creek wash, according to the Forest Service. Students of Caryn Elementary School are being bused to Perdue Elementary due to the fire, KSGN reports. Day Creek Intermediate School has been closed, and students are being taken at Heritage Intermediate School, which remains open. Chafee College announced that it's closing its Rancho Cucamonga campus, releasing students and canceling all classes scheduled for Wednesday. This comes at the same time as red flag warnings for large portions of the Southland.